A = 16 bars, always with 2-bar phrases which undergo melodic development. The bars 18+19 are a reminiscence of the first two bars. B = from bar 20 on, a new idea gains influence above a pedal-point A. The bars 25+26 reflect on the first bar of the movement. From bar 27 on, the 2nd idea appears above a pedal-point D. The bars 32+33 reflect once again on the first bar and are seen as a bridge to A´ = Reprise, lasting 12 bars, now based on a fundamental note G.
Coda = The Coda finds its way back to the original tonality and leads the melodic material of bars 1+2 in augmentation and with the accompanying function of the beginning to a closing pp. 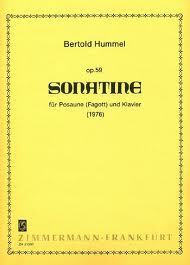 Sonatina for Trombone and Piano, op. 59a is a very interesting and accessible composition. Each movement drifts effortlessly between e minor and E major. The final cadence of the third movement back in E major perhaps gives a glimpse into Hummel's view on life. All movements also use the E triad, both major and minor as the basis for motivic development. The brooding first movement gives way to a more melancholy second which transitions into the syncopated and up beat third. The first and third movements are structured in a basic Sonata Allegro form: A theme, B theme, development and A theme return. The second movement is in an ABA form with a short coda. The B theme of the first movement starting in measure 19 includes a wonderful parallel 5th duet between the piano and trombone. Be sure to coordinate with the accompanist so that the note length between instruments is consistent. Given the open 5th mentioned, the octave and 4th/5th motives in movements 1 and 3 and the use of mute in movement 2, pitch in this piece has to be precise or it will be obviously incorrect. Open intervals provide little margin for intonation error. The Sonatina, op. 29a in three movements by the Würzburger Bertold Hummel was the discovery of the evening. An excellent interpretation was offered of this lively, transparent and witty composition. Dancing points of sound in the Allegro, a lyrical and sweeping Andante and finally melancholy passages in alternation with fast, jazz-like rhythms in the Vivace all the way through to the humorously placed closing chord were the components that made Hummel and the Duo Roblee with their perfectly coordinated precision a special pleasure.